Halloween celebration is still a foreign idea to me. Around this time, our thoughts are on our plans for All Soul’s Day. 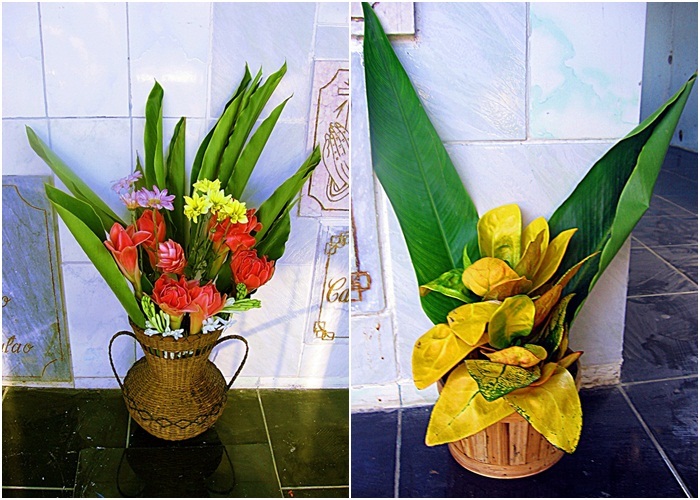 Since 2006, this has been our All Soul’s Day flower arrangement for our loved ones. It was just a makeshift cross. Floral foams are attached to secure the flowers in place. We then spray water on the foam and flowers to keep them fresh. Every year, we just replace the flowers. The cross is only made of scrap wood. The wood has deteriorated that last year, we can no longer hang it. It was place on top of the tomb instead. This year, the wood is too brittle to use. We had to discard it. We can no longer use it. 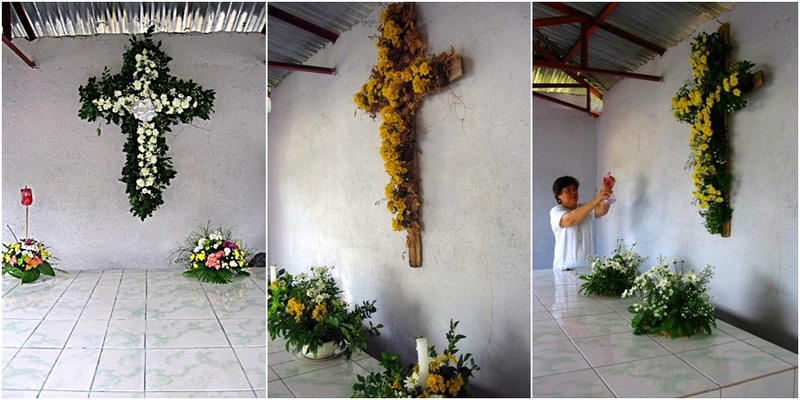 Flowers around this time are expensive We used to buy this yellow flowers at P25 for three bunches for the altar on a weekly basis. 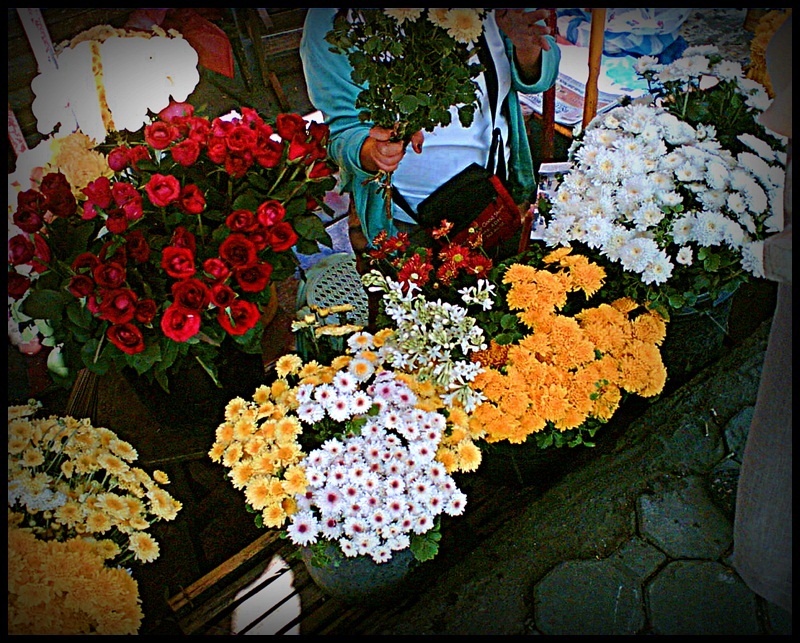 When we asked the flower vendor for the price early this week, it already cost P20 per bunch. We did not buy this time. 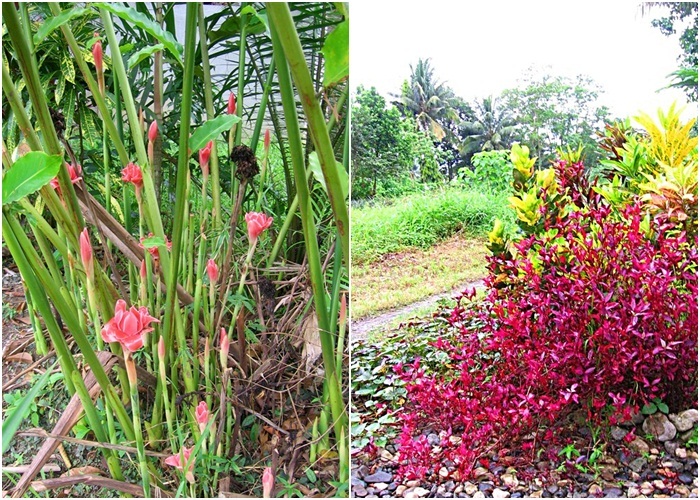 My aunts remembered that we have these plants in our garden. These garden flower were offered to our loved ones. We passed by these flowers in the cemetery pathways. I told my aunt that we should plant this type of flower in our garden so we can use them next year. She said she already did. I hope the plant grows well. Did you also visit your loved ones in the cemetery? Wow! I love your garden… and the flowers are soooo beautiful! beautiful flower arrangements…I hope you could grow more and more pretty flowers in your garden so you could create more artistic flower creations. 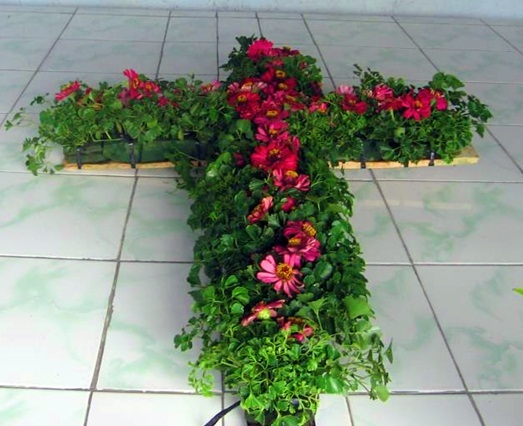 I like your idea of a cross made of flowers! 🙂 For us, we just prayed for our dearly departed. We couldn’t go home to the province, that’s why. Wow! 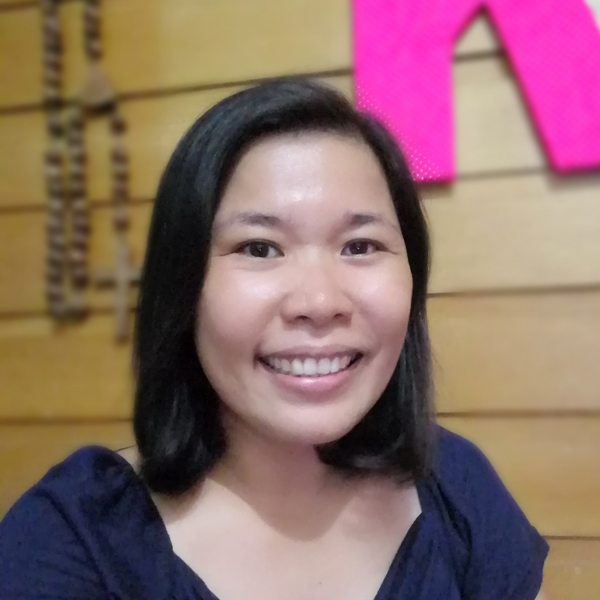 Ang galing nyo sis 🙂 Visiting from CommEx 10/30. I like to have a flower and herb garden some day. I didn’t go to the cemetery yet. It’s hard to go with three little children. We have an aunt who has a flower shop so we always have wonderful floral arrangements for our departed loved ones. We always use white flowers though. For my little angel in heaven, we always request for white roses and white orchids. Sorry to hear about your little angel. White flowers look pure and “heaven-like”. Those are called Zinias. My Mom grows them in her garden. Good job on the flower arrangements. If only we have the those zinnia flowers too I can surely used them instead of buying arranged flowers that get so expensive during November 1. That’s what I was thinking, too. 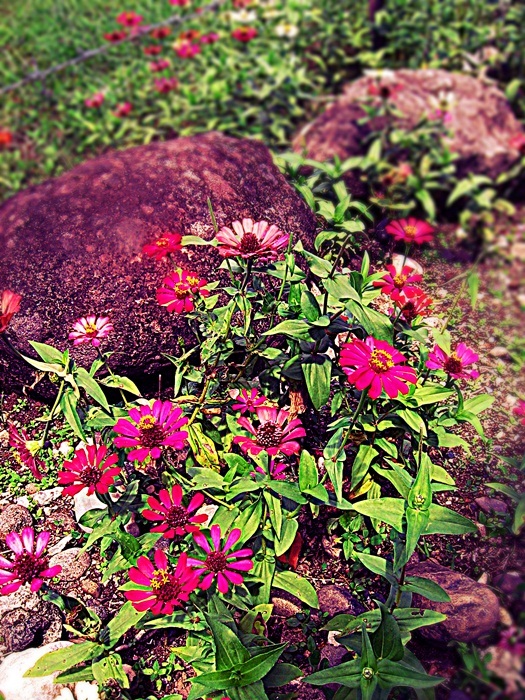 Besides, Zinnias are pretty. I like the last quote. Very true Nice flower arrangement sis. Visiting from CommEx 10/30. Nice one sis, super artistic naman ang planning nyo for the flowers… Anyway, did not have chance to visit to cementery all my loved ones are in Pinas and here in Norway, they don’t use to go either. Just prayed for them. Nice garden. You can get your flowers for decoration on your own garden. I like the idea of being placed in a Columbarium. very creative sis. I hope i have your skills. I like the cross arrangement.! I love flowers. I have roses, rosal, jasmine in my backyard. I live in Baguio and flowers grow easily here. I like the mass arrangement of flowers from your garden..nice idea.